This article is about the fastener. For the screw as a mechanism, see Screw (simple machine). For other uses, see Screw (disambiguation). A screw is a type of fastener, in some ways similar to a bolt (see Differentiation between bolt and screw below), typically made of metal, and characterized by a helical ridge, known as a male thread (external thread). Screws are used to fasten materials by digging in and wedging into a material when turned, while the thread cuts grooves in the fastened material that may help pull fastened materials together and prevent pull-out. There are many screws for a variety of materials; those commonly fastened by screws include wood, sheet metal, and plastic. A screw is a combination of simple machines—it is in essence an inclined plane wrapped around a central shaft, but the inclined plane (thread) also comes to a sharp edge around the outside, which acts a wedge as it pushes into the fastened material, and the shaft and helix also form a wedge in the form of the point. Some screw threads are designed to mate with a complementary thread, known as a female thread (internal thread), often in the form of a nut, or object that has the internal thread formed into it. Other screw threads are designed to cut a helical groove in a softer material as the screw is inserted. The most common uses of screws are to hold objects together and to position objects. A wood screw: a) head; b) not threaded shank; c) threaded shank; d) tip. The majority of screws are tightened by clockwise rotation, which is termed a right-hand thread; a common mnemonic device for remembering this when working with screws or bolts is "righty-tighty, lefty-loosey". If the fingers of the right hand are curled around a right-hand thread, it will move in the direction of the thumb when turned in the same direction as the fingers are curled. Screws with left-hand threads are used in exceptional cases, where loads would tend to loosen a right handed fastener, or when non-interchangeability with right-hand fasteners is required. For example, when the screw will be subject to counterclockwise torque (which would work to undo a right-hand thread), a left-hand-threaded screw would be an appropriate choice. The left side pedal of a bicycle has a left-hand thread. More generally, screw may mean any helical device, such as a clamp, a micrometer, a ship's propeller, or an Archimedes' screw water pump. This distinction is consistent with ASME B18.2.1 and some dictionary definitions for screw and bolt. Early wood screws were made by hand, with a series of files, chisels, and other cutting tools, and these can be spotted easily by noting the irregular spacing and shape of the threads, as well as file marks remaining on the head of the screw and in the area between threads. Many of these screws had a blunt end, completely lacking the sharp tapered point on nearly all modern wood screws. Eventually, lathes were used to manufacture wood screws, with the earliest patent being recorded in 1760 in England. During the 1850s swaging tools were developed to provide a more uniform and consistent thread. Screws made with these tools have rounded valleys with sharp and rough threads. Some wood screws were made with cutting dies as early as the late 1700s (possibly even before 1678 when the book content was first published in parts). Once screw turning machines were in common use, most commercially available wood screws were produced with this method. These cut wood screws are almost invariably tapered, and even when the tapered shank is not obvious, they can be discerned because the threads do not extend past the diameter of the shank. Such screws are best installed after drilling a pilot hole with a tapered drill bit. The majority of modern wood screws, except for those made of brass, are formed on thread rolling machines. These screws have a constant diameter, threads with a larger diameter than the shank, and are stronger because the rolling process does not cut the grain of the metal. ASME standards specify a variety of "Machine Screws" in diameters ranging up to 0.75 in (19.05 mm). These fasteners are often used with nuts but also often driven into tapped holes (without nuts). They might be considered a screw or a bolt based on the Machinery's Handbook distinction. In practice, they tend to be mostly available in smaller sizes and the smaller sizes are referred to as screws or less ambiguously as machine screws, although some kinds of machine screw can be referred to as stove bolts. ASME standard B18.2.1-1996 specifies Hex Cap Screws whose size range is 0.25–3 in (6.35–76.20 mm) in diameter. These fasteners are very similar to hex bolts. They differ mostly in that they are manufactured to tighter tolerances than the corresponding bolts. Machinery's Handbook refers parenthetically to these fasteners as "Finished Hex Bolts". Reasonably, these fasteners might be referred to as bolts, but based on the US government document Distinguishing Bolts from Screws, the US government might classify them as screws because of the tighter tolerance. In 1991 responding to an influx of counterfeit fasteners Congress passed PL 101-592 "Fastener Quality Act" This resulted in the rewriting of specifications by the ASME B18 committee. B18.2.1 was re-written and as a result they eliminated the "Finished Hex Bolts" and renamed them the "Hex Cap Screw"—a term that had existed in common usage long before, but was now also being codified as an official name for the ASME B18 standard. These terms refer to fasteners that are designed to be threaded into a tapped hole that is in part of the assembly and so based on the Machinery's Handbook distinction they would be screws. Here common terms are at variance with Machinery's Handbook distinction. Lag screws (US) or coach screws (UK, Australia, and New Zealand) (also referred to as lag bolts or coach bolts, although this is a misnomer) are large wood screws. Square-headed and hex-headed lag screws are covered by ASME B18.2.1 standards, and the head is typically an external hex. A typical lag screw can range in diameter from 1⁄4 to 1 1⁄4 in (6.35 to 31.75 mm), and lengths from 1⁄4 to 6 in (6.35 to 152.40 mm) or longer, with the coarse threads of a wood-screw or sheet-metal-screw threadform (but larger). The materials are usually carbon steel substrate with a coating of zinc galvanization (for corrosion resistance). The zinc coating may be bright (electroplated), yellow (electroplated), or dull gray hot-dip galvanized. Lag screws are used to lag together lumber framing, to lag machinery feet to wood floors, and for other heavy carpentry applications. The attributive modifier lag came from an early principal use of such fasteners: the fastening of lags such as barrel staves and other similar parts. These fasteners are "screws" according to the Machinery's Handbook criteria, and the obsolescent term "lag bolt" has been replaced by "lag screw" in the Handbook. However, to many tradesmen, they are "bolts", because they are large, with hex or square heads. The federal government of the United States made an effort to formalize the difference between a bolt and a screw, because different tariffs apply to each. The document seems to have no significant effect on common usage and does not eliminate the ambiguous nature of the distinction between screws and bolts for some threaded fasteners. The document also reflects (although it probably did not originate) significant confusion of terminology usage that differs between the legal/statutory/regulatory community and the fastener industry. The legal/statutory/regulatory wording uses the terms "coarse" and "fine" to refer to the tightness of the tolerance range, referring basically to "high-quality" or "low-quality", but this is a poor choice of terms, because those terms in the fastener industry have a different meaning (referring to the steepness of the helix's lead). Old USS and SAE standards defined cap screws as fasteners with shanks that were threaded to the head and bolts as fasteners with shanks that were partially unthreaded. The relationship of this rule to the idea that a bolt by definition takes a nut is clear (because the unthreaded section of the shank, which is called the grip, was expected to pass through the substrate without threading into it). This is now an obsolete distinction, although large bolts still often have unthreaded sections of shank. Although there is no reason to consider this definition obsolete, because it is far from clear that "a bolt by definition takes a nut". Using a coach "bolt" as an example (and it has been a 'bolt' for a very long time). It was not originally intended to receive a nut, but did have a shank. Its purpose was not to pass through the entire substrate but only one piece of it, while the threaded portion bit into the other in order to draw, and clamp the materials together. The 'carriage' bolt was derived from this and was employed more to speed up manufacturing than achieve a different function. The carriage bolt passes through both pieces of materials and employs a nut to provide the clamping force. Both are still, however, bolts. The distinctions above are enforced in the controlled vocabulary of standards organizations. Nevertheless, there are sometimes differences between the controlled vocabulary and the natural language use of the words by machinists, auto mechanics and others. These differences reflect linguistic evolution shaped by the changing of technology over centuries. The words bolt and screw have both existed since before today's modern mix of fastener types existed, and the natural usage of those words has evolved retronymously in response to the technological change. (That is, the use of words as names for objects changes as the objects change.) Non-threaded fasteners predominated until the advent of practical, inexpensive screw-cutting in the early 19th century. The basic meaning of the word screw has long involved the idea of a helical screw thread, but the Archimedes screw and the screw gimlet (like a corkscrew) preceded the fastener. The word bolt is also a very old word, and it was used for centuries to refer to metal rods that passed through the substrate to be fastened on the other side, often via nonthreaded means (clinching, forge welding, pinning, wedging, etc.). The connection of this sense to the sense of a door bolt or the crossbow bolt is apparent. In the 19th century, bolts fastened via screw threads were often called screw bolts in contradistinction to clench bolts. In common usage, the distinction (not rigorous) is often that screws are smaller than bolts, and that screws are generally tapered while bolts are not. For example, cylinder head bolts are called "bolts" (at least in North American usage) despite the fact that by some definitions they ought to be called "screws". Their size and their similarity to a bolt that would take a nut seem linguistically to overrule any other factors in this natural word choice proclivity. Bolts have been defined as headed fasteners having external threads that meet an exacting, uniform bolt thread specification (such as ISO metric screw thread M, MJ, Unified Thread Standard UN, UNR, and UNJ) such that they can accept a non-tapered nut. Screws are then defined as headed, externally threaded fasteners that do not meet the above definition of bolts. These definitions of screw and bolt eliminate the ambiguity of the Machinery's handbook distinction. And it is for that reason, perhaps, that some people favor them. However, they are neither compliant with common usage of the two words nor are they compliant with formal specifications. A possible distinction is that a screw is designed to cut its own thread; it has no need for access from or exposure to the opposite side of the component being fastened to. 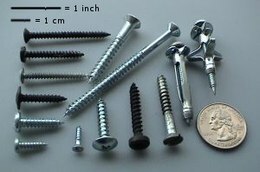 This definition of screw is further reinforced by the consideration of the developments of fasteners such as Tek Screws, with either round or hex heads, for roof cladding, self-drilling and self-tapping screws for various metal fastening applications, roof batten screws to reinforce the connection between the roof batten and the rafter, decking screws etc. On the other hand, a bolt is the male part of a fastener system designed to be accepted by a pre-equipped socket (or nut) of exactly the same thread design. Threaded fasteners either have a tapered shank or a non-tapered shank. Fasteners with tapered shanks are designed to either be driven into a substrate directly or into a pilot hole in a substrate. Mating threads are formed in the substrate as these fasteners are driven in. Fasteners with a non-tapered shank are designed to mate with a nut or to be driven into a tapped hole. particle board screw Similar to a drywall screw except that it has a thinner shank and provides better resistance to pull-out in particle board, while offset against a lower shear strength. The threads on particle board screws are asymmetrical. Titen A stainless or carbon steel screw for fastening wood, metal, or other materials to concrete or masonry. Concrete screws are commonly blue in color, with or without corrosion coating. They may either have a Phillips flat head or a slotted hex washer head. Nominal (thread) sizes range from 0.1875 to 0.375 in (4.763 to 9.525 mm) and lengths from 1.25 to 5 in (32 to 127 mm). Typically an installer uses a hammer drill to make a pilot hole for each concrete screw and a powered impact driver to drive the screw. deck screw Similar to drywall screw except that it has improved corrosion resistance and is generally supplied in a larger gauge. Most deck screws have a type-17 (auger type) thread cutting tip for installation into decking materials. They have bugle heads that allows the screw to depress the wood surface without breaking it. hanger bolt handrail bolt Similar to a wood screw but with two pointed ends and no head, used for making hidden joints between two pieces of wood. A hanger bolt has wood screw threads on one end and machine threads on the other. A hanger bolt is used when it is necessary to fasten a metal part to a wood surface. hammer drive screw Chiefly used for attaching manufacturers data plates to equipment. Smooth round or mushroom headed with a multi-start thread on the shank, beneath which is reduced diameter shank that acts as a pilot. The screw is fastened by hitting the head with a hammer and is not intended for removal. drywall screw Specialized screw with a bugle head that is designed to attach drywall to wood or metal studs, however it is a versatile construction fastener with many uses. The diameter of drywall screw threads is larger than the grip diameter. vine eye screw eye Screw with a looped head. Larger ones are sometimes called lag eye screws. Designed to be used as attachment point, particularly for something that is hung from it. A vine eye (in the UK at least) is similar to a screw eye, except that it has a proportionally longer shank and smaller looped head. As the term suggests vine eyes are often used for attaching wire lines across the surface of buildings so that climbing plants can attach themselves. lag screw coach screw Similar to a wood screw except that it is generally much larger running to lengths up to 15 in (381 mm) with diameters from 0.25–0.5 in (6.35–12.70 mm) in commonly available (hardware store) sizes (not counting larger mining and civil engineering lags and lag bolts) and it generally has a hexagonal drive head. Lag bolts are designed for securely fastening heavy timbers (post and beams, timber railway trestles and bridges) to one another, or to fasten wood to masonry or concrete. The German standard is DIN 571, Hexagon head wood screws. Lag bolts are usually used with an expanding insert called a lag in masonry or concrete walls, the lag manufactured with a hard metal jacket that bites into the sides of the drilled hole, and the inner metal in the lag being a softer alloy of lead, or zinc alloyed with soft iron. The coarse thread of a lag bolt and lag mesh and deform slightly making a secure near water tight anti-corroding mechanically strong fastening. mirror screw This is a flat-head wood screw with a tapped hole in the head, which receives a screw-in chrome-plated cover. It is usually used to mount a mirror. sheet metal screw Has sharp threads that cut into a material such as sheet metal, plastic or wood. They are sometimes notched at the tip to aid in chip removal during thread cutting. The shank is usually threaded up to the head. Sheet metal screws make excellent fasteners for attaching metal hardware to wood because the fully threaded shank provides good retention in wood. Twinfast screw A Twinfast screw is a type of screw with two threads (i.e. a twin-start screw), so that it can be driven twice as fast as a normal (i.e. single-start) screw with the same pitch. Dry wall screws designated as fine are the most common screws to use the twinfast style of threads. wood screw A metal screw with a sharp point designed to attach two pieces of wood together. Wood screws are commonly available with flat, pan or oval-heads. A wood screw generally has a partially unthreaded shank below the head. The unthreaded portion of the shank is designed to slide through the top board (closest to the screw head) so that it can be pulled tight to the board to which it is being attached. Inch-sized wood screws in the U.S. are defined by ANSI-B18.6.1-1981(R2003), while in Germany they are defined by DIN 95 (Slotted raised countersunk (oval) head wood screws), DIN 96 (Slotted round head wood screws), and DIN 97 (Slotted countersunk (flat) head wood screws). Security head screw These screws are use for security purposes and where vandalism and/or theft is likely. The head of this type of screw is impossible to reverse. It requires special tools or mechanisms like spanners, tri-wings, torxes, square drivers, etc. In some screws, the head can be removed by breaking it after installing the screw. anchor bolt A special type of bolt that is set in wet concrete, with the screw threads protruding above the concrete surface. breakaway bolt A breakaway bolt is a bolt with a hollow threaded shank, which is designed to break away upon impact. Typically used to fasten fire hydrants, so they will break away when hit by a car. Also used in aircraft to reduce weight. cap screw The term cap screw refers to many different things at different times and places. Currently, it most narrowly refers to a style of head (see the gallery below). More broadly, and more commonly, it refers to the group of screws: shoulder screws, hex heads, counter-sunk heads, button heads, and fillister heads. In the United States, cap screws are defined by ASME B18.6.2 and ASME B18.3. In the past, the term cap screw, in general, referred to screws that were supposed to be used in applications where a nut was not used; however, the characteristics that differentiate it from a bolt vary over time. In 1910, Anthony defined it as screw with a hex head that was thicker than a bolt head, but the distance across the flats was less than a bolt's. In 1913, Woolley and Meredith defined them like Anthony, but gave the following dimensions: hex head cap screws up to and including 7⁄16 inch (11.1125 mm) have a head that is 3⁄16 inch (4.7625 mm) larger than the shank diameter; screws greater than 1⁄2 inch (12.7 mm) in diameter have a head that is 1⁄4 inch (6.35 mm) larger than the shank. Square head cap screws up to and including 3⁄4 inch (19.05 mm) have a head 1⁄8 inch (3.175 mm) larger than the shank; screws larger than 3⁄4 inch (19.05 mm) have a head 1⁄4 inch (6.35 mm) larger than the shank. In 1919, Dyke defined them as screws that are threaded all the way to the head. A socket cap screw, also known as a socket head capscrew, socket screw, or Allen bolt, is a type of cap screw with a cylindrical head and hexagonal drive hole. The term socket head capscrew typically refers to a type of threaded fastener whose head diameter is nominally 1.5 times that of the screw shank (major) diameter, with a head height equal to the shank diameter (1960 series design). Forged heat-treated alloy examples are high strength fasteners intended for the most demanding mechanical applications, with special alloy formulations available that are capable of maintaining strength at temperatures in excess of 1000 degrees F (587 degrees C). In addition to the 1960 series design, other head designs include low head, button head and flat head, the latter designed to be seated into countersunk holes. A hex key (sometimes referred to as an Allen wrench or Allen key) or hex driver is required to tighten or loosen a socket screw. Socket head capscrews are commonly used in assemblies that do not provide sufficient clearance for a conventional wrench or socket. carriage bolt cup head bolt, coach bolt A carriage bolt, also known as a coach bolt, has a domed or countersunk head, and the shank is topped by a short square section under the head. The square section grips into the part being fixed (typically wood), preventing the bolt from turning when the nut is tightened. Carriage bolts are used to provide a smooth finish on automobile metal bumper exteriors, the square section aligning with a square hole in the bumper to provide anti-rotation. A rib neck carriage bolt has several longitudinal ribs instead of the square section, to grip into a metal part being fixed. elevator bolt An elevator bolt is a bolt similar to a carriage bolt, except the head (or foot, depending on the application) is thin and flat. There are many variations. Elevator bolts are designed to be used for leveling appliances or furniture. eye bolt An eye bolt is a bolt with a looped head. hex bolt A hex cap screw is a cap screw with a hexagonal head, designed to be driven by a wrench (spanner). An ASME B18.2.1 compliant cap screw has somewhat tighter tolerances than a hex bolt for the head height and the shank length. The nature of the tolerance difference allows an ASME B18.2.1 hex cap screw to always fit where a hex bolt is installed but a hex bolt could be slightly too large to be used where a hex cap screw is designed in. Fine adjustment screw The term fine adjustment screw typically refers to screws with threads from 40–100 TPI (Threads Per Inch) (0.5mm to 0.2mm pitch) and ultra fine adjustment screw has been used to refer to 100–254 TPI (0.2mm to 0.1mm pitch). These screws are most frequently used in applications where the screw is used to control fine motion of an object. machine screw A machine screw is generally a smaller fastener (less than 1⁄4 inch (6.35 mm) in diameter) threaded the entire length of its shank that usually has a recessed drive type (slotted, Phillips, etc.). Machine screws are also made with socket heads (see above), in which case they may be referred to as socket head machine screws. plow bolt plough bolt A plow bolt is bolt similar to a carriage bolt, except the head is flat or concave, and the underside of the head is a cone designed to fit in a countersunk recess. Plow bolts provide a smooth surface for attaching a plow moldboard to its beam, where a raised head would suffer from soil abrasion. There are many variations, with some not using a square base, but rather a key, a locking slot, or other means. The recess in the mating part must be designed to accept the particular plow bolt. ASME B18.9 standard recommends a No. 3 head (round countersunk head square neck) plow bolts and No. 7 head (round countersunk reverse key head) plow bolts for new designs. The necessary dimensions for the head styles can be found in the standard. Teks screw Similar to a sheet metal screw, but it has a drill-shaped point to cut through the substrate to eliminate the need for drilling a pilot hole. Designed for use in soft steel or other metals. The points are numbered from 1 through 5, the larger the number, the thicker metal it can go through without a pilot hole. A 5-point can drill a 0.5 in (12.7 mm) of steel, for example. self-tapping machine screw A self-tapping machine screw is similar to a machine screw except the lower part of the shank is designed to cut threads as the screw is driven into an untapped hole. The advantage of this screw type over a self-drilling screw is that, if the screw is reinstalled, new threads are not cut as the screw is driven. set bolt tap bolt A bolt that is threaded all the way to the head. An ASME B18.2.1 compliant set/tap bolt has the same tolerances as an ASME B18.2.1 compliant hex cap screw. set screw grub screw A set screw is generally a headless screw but can be any screw used to fix a rotating part to a shaft, such as a line shaft or countershaft. The set screw is driven through a threaded hole in the rotating part until it is tight against the shaft. The most often used type is the socket set screw, which is tightened or loosened with a hex key. shoulder screw stripper bolt A shoulder screw differs from machine screws in that the shank is held to a precise diameter, known as the shoulder, and the threaded portion is smaller in diameter than the shoulder. Shoulder screw specifications call out the shoulder diameter, shoulder length, and threaded diameter; the threaded length is fixed, based on the threaded diameter, and usually quite short. Shoulder screws can be manufactured in many materials such as alloy heat-treated steel for maximum strength and wear resistance and stainless steel for its corrosion-resistance and non-magnetic properties. Common applications for shoulder screws include rotating mechanism joints, linkage pivots, and guides for the stripper plate of a metal forming die set. In the latter application, the term stripper bolt is often substituted. Stainless steel shoulder screws are used with linear motion devices such as bearings, as guides and as pivots in electronic and other critical mechanical applications. stove bolt gutter bolt A stove bolt is a type of machine screw that has a round or flat head and is threaded to the head. They are usually made of low grade steel, have a slot or Phillips drive, and are used to join sheet metal parts using a hex or square nut. tension control bolt A tension control bolt (TC bolt) is a heavy duty bolt used in steel frame construction. The head is usually domed and is not designed to be driven. The end of the shank has a spline on it which is engaged by a special power wrench which prevents the bolt from turning while the nut is tightened. When the appropriate torque is reached the spline shears off. thread rolling screws These have a lobed (usually triangular) cross-section. They form threads in a pre-existing hole in the mating workpiece by pushing the material outward during installation. In some cases the properly prepared hole in sheetmetal uses an extruded hole. The extrusion forms a lead-in and extra thread length for improved retention. Thread rolling screws are often used where loose chips formed by a thread cutting operation cannot be tolerated. A fastener with a built in washer is called a SEM or SEMS, short for pre-asSEMbled. It could be fitted on either a tapered or non-tapered shank. A superbolt, or multi-jackbolt tensioner is an alternative type of fastener that retrofits or replaces existing nuts, bolts, or studs. Tension in the bolt is developed by torquing individual jackbolts, which are threaded through the body of the nut and push against a hardened washer. Because of this, the amount of torque required to achieve a given preload is reduced. Installation and removal of any size tensioner is achieved with hand tools, which can be advantageous when dealing with large diameter bolting applications. The field of screws and other hardware for internal fixation within the body is huge and diverse. Like prosthetics, it integrates the industrial and medicosurgical fields, causing manufacturing technologies (such as machining, CAD/CAM, and 3D printing) to intersect with the art and science of medicine. Like aerospace and nuclear power, this field involves some of the highest technology for fasteners, as well as some of the highest prices, for the simple reason that performance, longevity, and quality have to be excellent in such applications. Bone screws tend to be made of stainless steel or titanium, and they often have high-end features such as conical threads, multistart threads, cannulation (hollow core), and proprietary screw drive types (some not seen outside of these applications). These abbreviations have jargon currency among fastener specialists (who, working with many screw types all day long, have need to abbreviate repetitive mentions). The smaller basic ones can be built up into the longer ones; for example, if you know that "FH" means "flat head", then you may be able to parse the rest of a longer abbreviation containing "FH". These abbreviations are not universally standardized across corporations; each corporation can coin their own. The more obscure ones may not be listed here. The extra spacing between linked terms below helps the reader to see the correct parsing at a glance. SH socket head Although "socket head" could logically refer to almost any female drive, it refers by convention to hex socket head unless further specified. SHSS socket head set screw Sometimes Socket Head Shoulder Screw. SS set screw The abbreviation "SS" more often means stainless steel. Therefore, "SS cap screw" means "stainless steel cap screw" but "SHSS" means "socket head set screw". As with many abbreviations, users rely on context to diminish the ambiguity, although this reliance does not eliminate it. Screws and bolts are usually made of steel. Where great resistance to weather or corrosion is required, like in very small screws or medical implants, materials such as stainless steel, brass, titanium, bronze, silicon bronze or monel may be used. Galvanic corrosion of dissimilar metals can be prevented (using aluminum screws for double-glazing tracks for example) by a careful choice of material. Some types of plastic, such as nylon or polytetrafluoroethylene (PTFE), can be threaded and used for fastenings requiring moderate strength and great resistance to corrosion or for the purpose of electrical insulation. Often a surface coating is used to protect the fastener from corrosion (e.g. bright zinc plating for steel screws), to impart a decorative finish (e.g. japanning) or otherwise alter the surface properties of the base material. Selection criteria of the screw materials include: size, required strength, resistance to corrosion, joint material, cost and temperature. The American Institute of Steel Construction (AISC) 13th Edition Steel Design Manual section 16.1 chapter J-3 specifies the requirements for bolted structural connections. Structural bolts replaced rivets due to the decreasing cost and increasing strength of structural bolts in the 20th century. Connections are formed with two types of joints: slip-critical connections and bearing connections. In slip-critical connections, movement of the connected parts is a serviceability condition and bolts are tightened to a minimum required pretension. Slip is prevented through friction of the "faying" surface, that is the plane of shear for the bolt and where two members make contact. Because friction is proportional to the normal force, connections must be sized with bolts numerous and large enough to provide the required load capacity. However, this greatly decreases the shear capacity of each bolt in the connection. The second (and more common type) of connection is a bearing connection. In this type of connection, the bolts carry the load through shear and are only tightened to a "snug-fit". These connections require fewer bolts than slip-critical connections and therefore are a less expensive alternative. Slip-critical connections are more common on flange plates for beam and column splices and moment critical connections. Bearing type connections are used in lightweight structures and in member connections where slip is not important and prevention of structural failure is the design constraint. Common bearing type connections include: shear tabs, beam supports, gusset plates in trusses. The numbers stamped on the head of the bolt are referred to the grade of the bolt used in certain application with the strength of a bolt. High-strength steel bolts usually have a hexagonal head with an ISO strength rating (called property class) stamped on the head. And the absence of marking/number indicates a lower grade bolt with low strength. The property classes most often used are 5.8, 8.8, and 10.9. The number before the point is the ultimate tensile strength in MPa divided by 100. The number after the point is the multiplier ratio of yield strength to ultimate tensile strength. For example, a property class 5.8 bolt has a nominal (minimum) ultimate tensile strength of 500 MPa, and a tensile yield strength of 0.8 times ultimate tensile strength or 0.8(500) = 400 MPa. Ultimate tensile strength is the tensile stress at which the bolt fails. Tensile yield strength is the stress at which the bolt will yield in tension across the entire section of the bolt and receive a permanent set (an elongation from which it will not recover when the force is removed) of 0.2% offset strain. Proof strength is the usable strength of the fastener. Tension testing of a bolt up to the proof load should not cause permanent set of the bolt and should be conducted on actual fasteners rather than calculated. If a bolt is tensioned beyond the proof load, it may behave in plastic manner due to yielding in the threads and the tension preload may be lost due to the permanent plastic deformations. When elongating a fastener prior to reaching the yield point, the fastener is said to be operating in the elastic region; whereas elongation beyond the yield point is referred to as operating in the plastic region of the bolt material. If a bolt is loaded in tension beyond its proof strength, the yielding at the net root section of the bolt will continue until the entire section is begins to yield and it has exceeded its yield strength. If tension increases, the bolt fractures at its ultimate strength. Mild steel bolts have property class 4.6, with is 400 MPa ultimate strength and 0.6*400=240 MPa yield strength. High-strength steel bolts have property class 8.8, which is 800 MPa ultimate strength and 0.8*800=640 MPa yield strength or above. There are many standards governing the material and mechanical properties of imperial sized externally threaded fasteners. Some of the most common consensus standards for grades produced from carbon steels are ASTM A193, ASTM A307, ASTM A354, ASTM F3125, and SAE J429. Some of the most common consensus standards for grades produced from corrosion resistant steels are ASTM F593 & ASTM A193. The international standards for metric externally threaded fasteners are ISO 898-1 for property classes produced from carbon steels and ISO 3506-1 for property classes produced from corrosion resistant steels. A dome-shaped head used for decoration. Conical, with flat outer face and tapering inner face allowing it to sink into the material. The angle of the screw is measured as the full angle of the cone. Cylindrical, but with a slightly convex top surface. Height to diameter ratio is larger than cheese head. A flanged head can be any of the above head styles (except the countersunk styles) with the addition of an integrated flange at the base of the head. This eliminates the need for a flat washer. Some varieties of screw are manufactured with a break-away head, which snaps off when adequate torque is applied. This prevents tampering and also provides an easily inspectable joint to guarantee proper assembly. An example of this is the shear bolts used on vehicle steering columns, to secure the ignition switch. Modern screws employ a wide variety of drive designs, each requiring a different kind of tool to drive in or extract them. The most common screw drives are the slotted and Phillips in the US; hex, Robertson, and Torx are also common in some applications, and Pozidriv has almost completely replaced Phillips in Europe. Some types of drive are intended for automatic assembly in mass-production of such items as automobiles. More exotic screw drive types may be used in situations where tampering is undesirable, such as in electronic appliances that should not be serviced by the home repair person. The hand tool used to drive in most screws is called a screwdriver. A power tool that does the same job is a power screwdriver; power drills may also be used with screw-driving attachments. Where the holding power of the screwed joint is critical, torque-measuring and torque-limiting screwdrivers are used to ensure sufficient but not excessive force is developed by the screw. The hand tool for driving hex head threaded fasteners is a spanner (UK usage) or wrench (US usage), while a nut setter is used with a power screw driver. There are many systems for specifying the dimensions of screws, but in much of the world the ISO metric screw thread preferred series has displaced the many older systems. Other relatively common systems include the British Standard Whitworth, BA system (British Association), and the Unified Thread Standard. The basic principles of the ISO metric screw thread are defined in international standard ISO 68-1 and preferred combinations of diameter and pitch are listed in ISO 261. The smaller subset of diameter and pitch combinations commonly used in screws, nuts and bolts is given in ISO 262. The most commonly used pitch value for each diameter is the coarse pitch. For some diameters, one or two additional fine pitch variants are also specified, for special applications such as threads in thin-walled pipes. ISO metric screw threads are designated by the letter M followed by the major diameter of the thread in millimeters (e.g. M8). If the thread does not use the normal coarse pitch (e.g. 1.25 mm in the case of M8), then the pitch in millimeters is also appended with a multiplication sign (e.g. "M8×1" if the screw thread has an outer diameter of 8 mm and advances by 1 mm per 360° rotation). The nominal diameter of a metric screw is the outer diameter of the thread. The tapped hole (or nut) into which the screw fits, has an internal diameter which is the size of the screw minus the pitch of the thread. Thus, an M6 screw, which has a pitch of 1 mm, is made by threading a 6 mm shank, and the nut or threaded hole is made by tapping threads into a hole of 5 mm diameter (6 mm - 1 mm). The first person to create a standard (in about 1841) was the English engineer Sir Joseph Whitworth. Whitworth screw sizes are still used, both for repairing old machinery and where a coarser thread than the metric fastener thread is required. Whitworth became British Standard Whitworth, abbreviated to BSW (BS 84:1956) and the British Standard Fine (BSF) thread was introduced in 1908 because the Whitworth thread was too coarse for some applications. The thread angle was 55°, and the depth and pitch varied with the diameter of the thread (i.e., the bigger the bolt, the coarser the thread). Spanners for Whitworth bolts are marked with the size of the bolt, not the distance across the flats of the screw head. The most common use of a Whitworth pitch nowadays is in all UK scaffolding. Additionally, the standard photographic tripod thread, which for small cameras is 1/4" Whitworth (20 tpi) and for medium/large format cameras is 3/8" Whitworth (16 tpi). It is also used for microphone stands and their appropriate clips, again in both sizes, along with "thread adapters" to allow the smaller size to attach to items requiring the larger thread. Note that while 1/4" UNC bolts fit 1/4" BSW camera tripod bushes, yield strength is reduced by the different thread angles of 60° and 55° respectively. British Association (BA) screw threads, named after the British Association for Advancement of Science, were devised in 1884 and standardised in 1903. Screws were described as "2BA", "4BA" etc., the odd numbers being rarely used, except in equipment made prior to the 1970s for telephone exchanges in the UK. This equipment made extensive use of odd-numbered BA screws, in order—it may be suspected—to reduce theft. BA threads are specified by British Standard BS 93:1951 "Specification for British Association (B.A.) screw threads with tolerances for sizes 0 B.A. to 16 B.A." mm (3.62mm). Although 0BA has the same diameter and pitch as ISO M6, the threads have different forms and are not compatible. BA threads are still common in some niche applications. Certain types of fine machinery, such as moving-coil meters and clocks, tend to have BA threads wherever they are manufactured. BA sizes were also used extensively in aircraft, especially those manufactured in the United Kingdom. BA sizing is still used in railway signalling, mainly for the termination of electrical equipment and cabling. BA threads are extensively used in Model Engineering where the smaller hex head sizes make scale fastenings easier to represent. As a result, many UK Model Engineering suppliers still carry stocks of BA fasteners up to typically 8BA and 10BA. 5BA is also commonly used as it can be threaded onto 1/8 rod. The Unified Thread Standard (UTS) is most commonly used in the United States, but is also extensively used in Canada and occasionally in other countries. The size of a UTS screw is described using the following format: X-Y, where X is the nominal size (the hole or slot size in standard manufacturing practice through which the shank of the screw can easily be pushed) and Y is the threads per inch (TPI). For sizes ​1⁄4 inch and larger the size is given as a fraction; for sizes less than this an integer is used, ranging from 0 to 16. The integer sizes can be converted to the actual diameter by using the formula 0.060 + (0.013 × number). For example, a #4 screw is 0.060 + (0.013 × 4) = 0.060 + 0.052 = 0.112 inches in diameter. There are also screw sizes smaller than "0" (zero or ought). The sizes are 00, 000, 0000 which are usually referred to as two ought, three ought, and four ought. Most eyeglasses have the bows screwed to the frame with 00-72 (pronounced double ought – seventy two) size screws. To calculate the major diameter of "ought" size screws count the number of 0's and multiply this number by 0.013 and subtract from 0.060. For example, the major diameter of a 000-72 screw thread is .060 – (3 x .013) = 0.060 - 0.039 = .021 inches. For most size screws there are multiple TPI available, with the most common being designated a Unified Coarse Thread (UNC or UN) and Unified Fine Thread (UNF or UF). Note: In countries other than the United States and Canada, the ISO Metric Screw Thread System is primarily used today. Unlike most other countries the United States and Canada still use the Unified (Inch) Thread System. However, both are moving over to the ISO Metric System. It is estimated that approximately 60% of screw threads in use in the United States are still inch based. There are three steps in manufacturing a screw: heading, thread rolling, and coating. Screws are normally made from wire, which is supplied in large coils, or round bar stock for larger screws. The wire or rod is then cut to the proper length for the type of screw being made; this workpiece is known as a blank. It is then cold headed, which is a cold working process. Heading produces the head of the screw. The shape of the die in the machine dictates what features are pressed into the screw head; for example a flat head screw uses a flat die. For more complicated shapes two heading processes are required to get all of the features into the screw head. This production method is used because heading has a very high production rate, and produces virtually no waste material. Slotted head screws require an extra step to cut the slot in the head; this is done on a slotting machine. These machines are essentially stripped down milling machines designed to process as many blanks as possible. The blanks are then polished again prior to threading. The threads are usually produced via thread rolling; however, some are cut. The workpiece is then tumble finished with wood and leather media to do final cleaning and polishing. For most screws, a coating, such as electroplating with zinc (galvanizing) or applying black oxide, is applied to prevent corrosion. A lathe of 1871, equipped with leadscrew and change gears for single-point screw-cutting. A Brown & Sharpe single-spindle screw machine. While a recent hypothesis attributes the Archimedes' screw to Sennacherib, King of Assyria, archaeological finds and pictorial evidence only appear in the Hellenistic period and the standard view holds the device to be a Greek invention, most probably by the 3rd century BC polymath Archimedes. [dubious – discuss] Though resembling a screw, this is not a screw in the usual sense of the word. Earlier, the screw had been described by the Greek mathematician Archytas of Tarentum (428–350 BC). By the 1st century BC, wooden screws were commonly used throughout the Mediterranean world in screw presses for pressing olive oil from olives and pressing juice from grapes in winemaking. Metal screws used as fasteners were rare in Europe before the 15th century, if known at all. There were many forms of fastening in use before threaded fasteners became widespread. They tended to involve carpentry and smithing rather than machining, and they involved concepts such as dowels and pins, wedging, mortises and tenons, dovetails, nailing (with or without clenching the nail ends), forge welding, and many kinds of binding with cord made of leather or fiber, using many kinds of knots. Prior to the mid-19th century, cotter pins or pin bolts, and "clinch bolts" (now called rivets), were used in shipbuilding. Glues also existed, although not in the profusion seen today. The metal screw did not become a common fastener until machine tools for their mass production were developed toward the end of the 18th century. This development blossomed in the 1760s and 1770s along two separate paths that soon converged: the mass production of wood screws (meaning screws made of metal to be used in wood) in a specialized, single-purpose, high-volume-production machine tool; and the low-count, toolroom-style production of machine screws (V-thread) with easy selection among various pitches (whatever the machinist happened to need on any given day). The first path was pioneered by brothers Job and William Wyatt of Staffordshire, UK, who patented in 1760 a machine that we might today best call a screw machine of an early and prescient sort. It made use of a leadscrew to guide the cutter to produce the desired pitch, and the slot was cut with a rotary file while the main spindle held still (presaging live tools on lathes 250 years later). Not until 1776 did the Wyatt brothers have a wood-screw factory up and running. Their enterprise failed, but new owners soon made it prosper, and in the 1780s they were producing 16,000 screws a day with only 30 employees—the kind of industrial productivity and output volume that would later be characteristic of modern industry but was revolutionary at the time. Meanwhile, English instrument maker Jesse Ramsden (1735–1800) was working on the toolmaking and instrument-making end of the screw-cutting problem, and in 1777 he invented the first satisfactory screw-cutting lathe. The British engineer Henry Maudslay (1771–1831) gained fame by popularizing such lathes with his screw-cutting lathes of 1797 and 1800, containing the trifecta of leadscrew, slide rest, and change-gear gear train, all in the right proportions for industrial machining. In a sense he unified the paths of the Wyatts and Ramsden and did for machine screws what had already been done for wood screws, i.e., significant easing of production spurring commodification. His firm would remain a leader in machine tools for decades afterward. A misquoting of James Nasmyth popularized the notion that Maudslay had invented the slide rest, but this was incorrect; however, his lathes helped to popularize it. These developments of the 1760–1800 era, with the Wyatts and Maudslay being arguably the most important drivers, caused great increase in the use of threaded fasteners. Standardization of threadforms began almost immediately, but it was not quickly completed; it has been an evolving process ever since. Further improvements to the mass production of screws continued to push unit prices lower and lower for decades to come, throughout the 19th century. The American development of the turret lathe (1840s) and of automatic screw machines derived from it (1870s) drastically reduced the unit cost of threaded fasteners by increasingly automating the machine tool control. This cost reduction spurred ever greater use of screws. Throughout the 19th century, the most commonly used forms of screw head (that is, drive types) were simple internal-wrenching straight slots and external-wrenching squares and hexagons. These were easy to machine and served most applications adequately. Rybczynski describes a flurry of patents for alternative drive types in the 1860s through 1890s, but explains that these were patented but not manufactured due to the difficulties and expense of doing so at the time. In 1908, Canadian P. L. Robertson was the first to make the internal-wrenching square socket drive a practical reality by developing just the right design (slight taper angles and overall proportions) to allow the head to be stamped easily but successfully, with the metal cold forming as desired rather than being sheared or displaced in unwanted ways. Practical manufacture of the internal-wrenching hexagon drive (hex socket) shortly followed in 1911. In the early 1930s, the popular Phillips-head screw was invented by American Henry F. Phillips. Threadform standardization further improved in the late 1940s, when the ISO metric screw thread and the Unified Thread Standard were defined. Precision screws, for controlling motion rather than fastening, developed around the turn of the 19th century, were one of the central technical advances, along with flat surfaces, that enabled the industrial revolution. They are key components of micrometers and lathes. ^ Smith 1990, p. 39. ^ Oberg et al. 2000, p. 1492. ^ "Cambridge Dictionary of American English". Cambridge University Press. Retrieved 2008-12-03. ^ "Merriam Webster Dictionary bolt". Retrieved 2008-12-03. ^ "Compact Oxford English Dictionary bolt". Oxford. Retrieved 2008-12-03. ^ "Cambridge Advanced Learner's Dictionary bolt". Cambridge University Press. Retrieved 2008-12-03. ^ "The Fastener Resource Center - Know your Bolts". Retrieved 2011-03-13. ^ a b White, Christopher. "Observations on the Development of Wood Screws in North America" (PDF). ^ "Making 18th c wood screws". ^ "Iron Age, Volume 44". ^ Moxon, Joseph (1703). Mechanic Exercises: Or the Doctrine of Handy-Works. Mendham, NJ. ^ Oberg et al. 2000, pp. 1568–1598. ^ Oberg et al. 2000, p. 1496. ^ "Distinguishing Bolts from Screws page 7" (PDF). Retrieved 2018-07-23. ^ "National Institute of Standards and Technology - NIST". NIST. Archived from the original on 2011-07-21. ^ "autorepair.com Glossary - lug bolt". Retrieved 2009-01-13. ^ "autozone.com Glossary - head bolt". Retrieved 2010-10-13. ^ Merriam-Webster's Unabridged Dictionary, Merriam-Webster. ^ Oberg et al. 2000, p. 1497. ^ U.S. Customs and Border Protection Agency (CBP) (July 2012), What Every Member of the Trade Community Should Know About: Distinguishing Bolts from Screws, An Informed Compliance Publication (2011-02 ed. ), Washington, D.C., USA: CBP.gov. ^ a b Dyke's Automobile and Gasoline Engine Encyclopedia page 701, A.L. Dyke, 1919, retrieved 2009-01-13. ^ "Tricks of the Trade". Motorcycle Mechanics. London: Fetter Publications. 2 (12): 60. September 1960. ^ "coach screw definition". dictionary.com. Retrieved 2010-01-19. ^ Soled, Julius (1957), Fasteners handbooks, Reinhold, p. 151. ^ "Fine thread drywall screws". Mutual Screw & Fastener Supply. Retrieved 2011-03-16. ^ Oberg 2000, pp. 1599–1605. ^ Anthony, Gardner Chase (1910), Machine Drawing, D. C. Heath, p. 16. ^ Woolley, Joseph William; Meredith, Roy Brodhead (1913), Shop sketching, McGraw-Hill, pp. 40–41. ^ "elevator head definition". myword.info. ^ Colvin & Stanley 1914, p. 569. ^ Plow bolts, retrieved 2008-12-25. ^ "All About Screws" (PDF). Curious Inventor. Retrieved 17 October 2013. ^ "Glossary". Retrieved 17 October 2013. ^ Brenner, Harry S. (1977). Parmley, Robert O. (ed.). Standard Handbook of Fastening and Joining (5 ed.). New York: McGraw-Hill. p. Chapter 1 page 10. ISBN 0-07-048511-9. ^ "How to Recognize Metric and SAE Bolts", Chilton DIY, Retrieved April 26, 2016. ^ "Fraudulent/Counterfeit Electronic Parts", SAE International, Retrieved April 26, 2016. ^ a b c Bolt grade markings and strength chart, retrieved 2009-05-29. ^ Mechanical Methods of Joining, retrieved 2009-06-06. ^ a b c d e f g h i Grade Markings: Carbon Steel Bolts, retrieved 2009-05-30. ^ a b c d e f Hardware, bulk — Technical information, retrieved 2009-05-30. ^ a b c d e f g h ASTM, SAE and ISO grade markings and mechanical properties for steel fasteners, retrieved 2009-06-06. ^ a b c Fastener identification marking (PDF), retrieved 2009-06-23. ^ a b c FastenalTechnicalReferenceGuide (PDF), retrieved 2010-04-30. ^ Metric Handbook, archived from the original on 2007-10-31, retrieved 2009-06-06. ^ Mechanical properties of bolts, screws, and studs according DIN-ISO 898, part 1 (PDF), retrieved 2009-06-06. ^ a b ASTM F568M - 07, 2007, retrieved 2009-06-06. ^ a b c d Metric structural fasteners, archived from the original on 1999-04-21, retrieved 2009-06-06. ^ a b ASTM A325M - 09, retrieved 2009-06-13. ^ a b ASTM A490M - 09, 2009, retrieved 2009-06-06. ^ "Different Kinds of Bolt and Screw Heads", AFI, Retrieved April 26, 2016. ^ a b Mitchell, George (1995), Carpentry and Joinery (3rd ed. ), Cengage Learning, p. 205, ISBN 978-1-84480-079-7. ^ a b Rybczynski 2000, pp. 97–99. ^ Stephanie Dalley and John Peter Oleson (January 2003). "Sennacherib, Archimedes, and the Water Screw: The Context of Invention in the Ancient World", Technology and Culture 44 (1). ^ Am_Wood_Screws (PDF), retrieved 2010-04-30. ^ Rybczynski 2000, pp. 34, 66, 90. ^ Rybczynski 2000, pp. 32–36, 44. ^ Rybczynski 2000, pp. 75–99. ^ Rybczynski 2000, p. 99. ^ a b c Rybczynski 2000, p. 75. ^ Rybczynski 2000, p. 76. ^ Rybczynski 2000, pp. 76–78. ^ a b Rybczynski 2000, pp. 79–81. ^ Hallowell 1951, pp. 51–59. Henry F. Phillips and Thomas M. Fitzpatrick, "Screw," U.S. Patent no. 2,046,839 (filed: January 15, 1935 ; issued: July 7, 1936). Henry F. Phillips and Thomas M. Fitzpatrick, "Screw driver," U.S. Patent no. 2,046,840 (filed: January 15, 1935 ; issued: July 7, 1936). ^ Rybczynski 2000, p. 104. Bickford, John H.; Nassar, Sayed (1998), Handbook of bolts and bolted joints, CRC Press, ISBN 978-0-8247-9977-9. Colvin, Fred Herbert; Stanley, Frank Arthur (1914), American Machinists' Handbook and Dictionary of Shop Terms (2nd ed. ), McGraw-Hill. Hallowell, Howard Thomas, Sr (1951), How a Farm Boy Built a Successful Corporation: An Autobiography, Jenkintown, Pennsylvania, USA: Standard Pressed Steel Company, LCCN 52001275, OCLC 521866. Huth, Mark W. (2003), Basic Principles for Construction, Cengage Learning, ISBN 1-4018-3837-5. Oberg, Erik; Jones, Franklin D.; Horton, Holbrook L.; Ryffel, Henry H. (2000), Machinery's Handbook (26th ed. ), New York: Industrial Press Inc., ISBN 0-8311-2635-3. Rybczynski, Witold (2000), One Good Turn: A Natural History of the Screwdriver and the Screw, Scribner, ISBN 978-0-684-86729-8, LCCN 00036988, OCLC 462234518. Various republications (paperback, e-book, braille, etc). Ryffel, Henry H.; et al. (1988), Machinery's Handbook (23rd ed. ), New York: Industrial Press, ISBN 978-0-8311-1200-4. Smith, Carroll (1990), Carroll Smith's Nuts, Bolts, Fasteners, and Plumbing Handbook, MotorBooks/MBI Publishing Company, ISBN 0-87938-406-9. Wikimedia Commons has media related to Screw. Wikisource has the text of the Encyclopaedia Britannica (9th ed.) article Screw.